The Broadcom white paper, Black Hole Detection by BroadView™ Instrumentation Software, describes the challenge of detecting and isolating packet loss caused by inconsistent routing in leaf-spine fabrics. 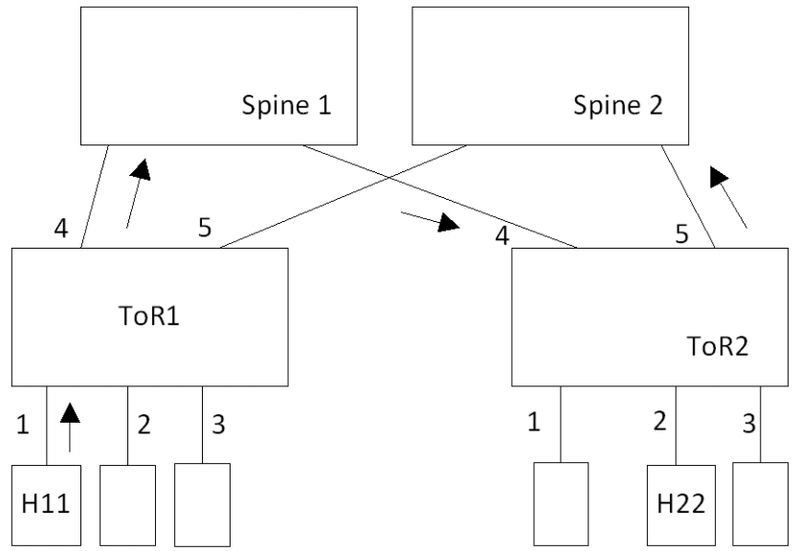 The diagram from the paper provides an example, packets from host H11 to H22 are being forwarded by ToR1 via Spine1 to ToR2 even though the route to H22 has been withdrawn from ToR2. 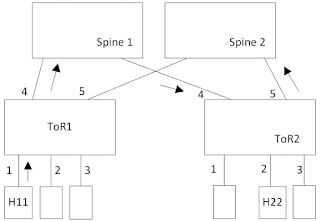 Since ToR2 doesn't have a route to the host, it sends the packet back up to Spine 2, which will send the packet back to ToR2, causing the packet to bounce back and forth until the IP time to live (TTL) expires. The white paper discusses how Broadcom ASICs can be programmed to detect blackholes based on packet paths, i.e. packets arriving at a ToR switch from a Spine switch should never be forwarded to another Spine switch. This article will discuss how the industry standard sFlow instrumentation (also included in Broadcom based switches) can be used to provide fabric wide detection of black holes. The diagram shows a simple test network built using Cumulus VX virtual machines to emulate a four switch leaf-spine fabric like the one described in the Broadcom white paper (this network is described in Open Virtual Network (OVN) and Network virtualization visibility demo). The emulation of the control plane is extremely accurate since the same Cumulus Linux distribution that runs on physical switches is running in the Cumulus VX virtual machine. In this case BGP is being used as the routing protocol (see BGP configuration made simple with Cumulus Linux). The same open source Host sFlow agent is running on the Linux servers and switches, streaming real-time telemetry over the out of band management network to sFlow analysis software running on the management server. 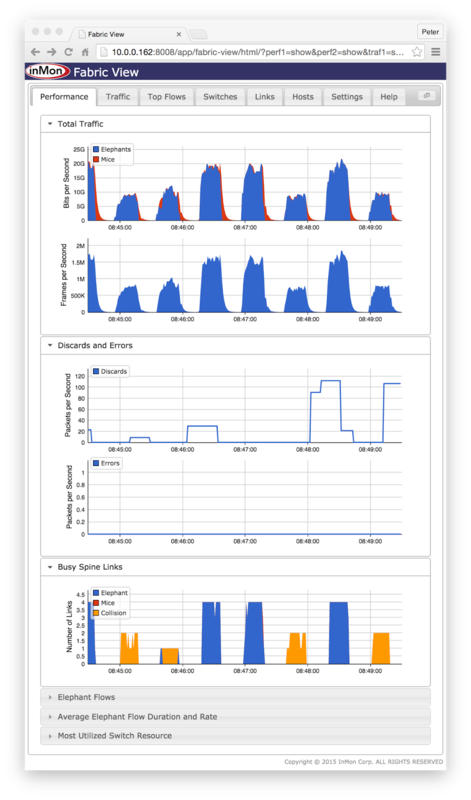 Fabric View is an open source application, running on the sFlow-RT real-time analytics engine, designed to monitor the performance of leaf-spine fabrics. The sFlow-RT Download page has instructions for downloading and installing sFlow-RT and Fabric View. The Fabric View application needs two pieces of configuration information: the network topology and the address allocation. The fv-blackhole-ttl script relies on the fact that the servers are running Linux which uses an initial TTL of 64. Since it only takes 3 routing hops to traverse the leaf-spine fabric, any TTL values of 60 or smaller are an indication of a potential routing loop and black hole. Flow records are generated as soon as a match is found and the setFlowHandler() function is uses to process the records, in this case logging warning messages. Exporting events using syslog describes how to send events to SIEM tools like Logstash or Splunk so that they can be queried. The script can also be extended to perform further analysis, or to automatically apply remediation controls. This example demonstrates the versatility of the sFlow architecture, shifting flow analytics from devices to external software makes it easy to deploy new capabilities. The real-time networking, server, and application analytics provided by sFlow-RT delivers actionable data through APIs and can easily be integrated with a wide variety of on-site and cloud, orchestration, DevOps and Software Defined Networking (SDN) tools. Thanks for this post.. Is the default route always pointing to the spine layer? If that is true then only we would have a condition that route is not setup in HW yet and we received packet for that route from spine layer. Hence we forward it back to the spine layer. And what happens when we have three layered topology -- say super-spine, spine and ToR layer. We have ecmp in between all the layers so the return packet from ToR to spine to super spine... How will we handle this case? Say at the spine layer we say default route is to forward it to the super spine layer. Then we can detect blackholing when a packet arrives from the super spine layer. How will we detect when packet comes from ToR layer and we dont have the route set in HW. We'll still forward it out using default route to the spine layer. 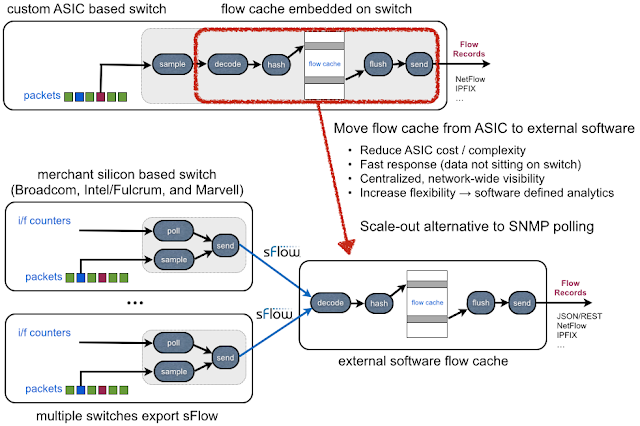 Transient paths that exist before routes are pushed into switch HW are possible, but once the routed ECMP fabric is up, routing should be stable with no further changes made unless there is a switch or link failure. The example can be extended to three or more layer topologies. The TTL check is based on network diameter, e.g. change the diam=4 for three layers. The path check for the leaf layer stays the same, but you could add a similar test for the middle layer, looking for packets that arrive from the top layer and return to the top layer. Encoding the layering information in the node and link names makes the checks easier to construct. The concept of the blackhole tests in this article can be generalized. Think about the tests as assertions about the intended operation of the network. The sFlow data reveals how the datapath in each switch is forwarding packets (along with all the details about the packets being forwarded - the first 128 bytes of the packet). Creating rules based on forwarding path and packet attribute is a general way of detecting forwarding anomalies.